The King is out on DVD on October 1st. Put on your blue suede shoes and get ready for a unique musical road trip with The King. 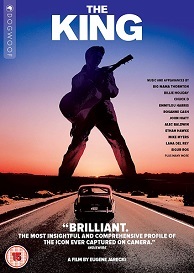 Two-time Sundance Grand Jury winning filmmaker Eugene Jarecki (Why We Fight, The House I Live In), is our guide to an eye-opening journey across America from Memphis to New York and of course taking in Las Vegas, to track the rise and fall of Elvis, in this brand new feature documentary. The fascinating journey follows Jarecki as he takes to the road in the star’s very own 1963 Rolls Royce to meet and interview the people and visit the places the legendary singer made an impact on. The King paints a visionary portrait of the state of the American dream and looks at how the hell we got here. Featuring an impressive cast including Alec Baldwin, Rosanne Cash, Chuck D, Ethan Hawke, Mike Myers and many more, this groundbreaking film arrives on DVD 1 October 2018 from Dogwoof.